One landscape company found new work amid the foreclosure crisis. In 2008, the economic downturn left many landscape business owners wondering if they would survive. As businesses and homeowners cut back on expenses, landscaping services often got the axe. Many companies were looking for ways to diversify. Around this time, J. Barker Landscaping Co. in Bedford, Ohio, found itself in a holding pattern on an urban garden project with the city of Cleveland. It couldn’t be completed until a home was demolished. The company’s forte—high-end residential design/build work—had slowed down along with the economy, and J. Barker’s management felt stuck. While the company waited for the demolition firm to tear down the house, the idea to do it themselves was born. After renting an excavator and successfully completing the job, the group decided to enter the demolition business officially. After demolishing its first home, it wasn’t long before the city—in the midst of a foreclosure crisis—came forward with more jobs, says Brandon Barker, commercial operations manager for the company. It was obvious there was a market for this line of work. In fact, at that time, the city of Cleveland had 14,000 vacant homes that had to be torn down. Getting the demolition division up and running as The Barker Group took about a $50,000 investment. Though the company already had a large, semi flatbed trailer and truck, it had to buy an excavator, a semi-tractor and some larger tandem axle dump trucks. 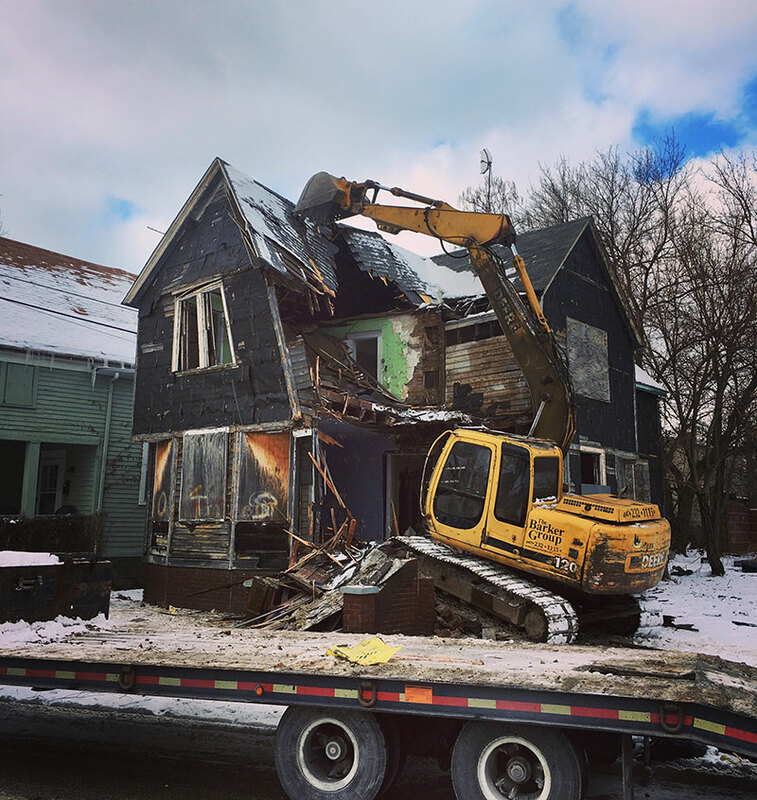 It also had to register as a demolition contractor with the city, and it became a contractor for the Cuyahoga Land Bank, a nonprofit entity dedicated to eliminating vacant, blighted properties in the county where Cleveland is located. Barker says demolition has been a perfect fit with the company’s existing landscaping work. In fact, jobs often seamlessly transition from demolition into landscaping now that they do both. After a property is torn down and proper grading is done, the next step is seeding—so, the landscaping work begins. Getting into the demolition business has been a fairly smooth transition, but Barker says a learning curve exists when using a larger machine. Luckily, the company’s existing operators picked up the role, and it didn’t need to hire anyone. As for manpower, most jobs involve an excavator operator and two dump truck drivers, who drive back and forth from the landfill each day, dropping off construction debris and bringing back dirt to fill in the hole. Dumping fees and time spent dumping are costs associated with demolition work, Barker says. Today, the company has done several hundred demolitions. The investment in the equipment has been beneficial not only for the demolition work but also because a lot of it can be used for landscaping. Barker says getting into demolition has been a great fit for the company, but the risky work is not something to just jump into.